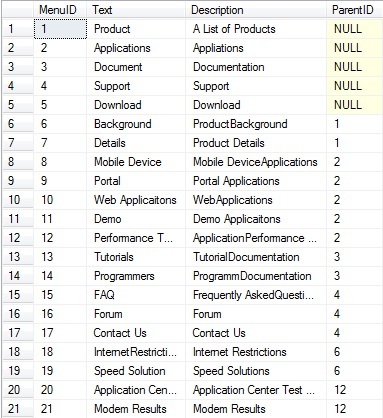 How to Display Hierarchical Data with ASP.NET Menu Control using C# and VB.NET. Each step is explained and illustrated so that you can quickly grasp things from this post to build your web application's menu. Our menu's table will use a self-join relationship which is the simplest method of storing hierarchical data. Child rows will use ParentID to establish a relationship with the MenuID of a parent row as shown below. Let us start by creating a Table called Menu in our database. The table you created, displayed below, uses self-join relationships. Rows that have a MenuID between 1 through 5 do not have parents and are considered root menu nodes. Rows with MenuID of 6 and 7 are children of MenuID 1, and so on. 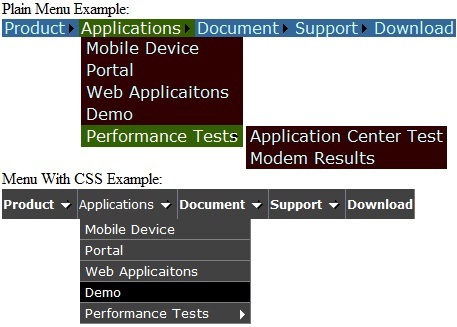 Add a new WebForm to your web application. Drag and drop a Menu and an XmlDataSource from the toolbar onto the WebForm with the following properties. Listing below contains Mark up for both menu, have a look. <asp:Menu ID="Menu1" DataSourceID="XmlDataSource1" runat="server" BackColor="#336699"
<asp:Menu ID="myslidemenu" DataSourceID="XmlDataSource1" runat="server" DynamicHorizontalOffset="2"
At runtime, the XmlDataSource object is assigned an XML string (shown in step 3) which is then transformed by the XSLT file, TransformXSLT.xsl to another XML format (XSLT is covered in step 4). 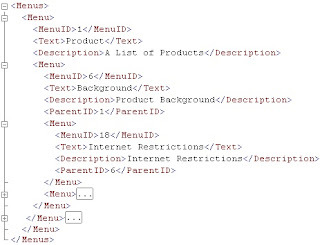 The transformed XML is then consumed by the Menu as specified by the Menu's DataSourceID property. Note: We are using the XmlDataSource property, XPath, to introduce an optional way to exclude the XML root node, MenuItems. If the root node is not excluded then the menu will contain an extra level which can be controlled using the menu property StaticDisplayLevels. The MenuItems root nodes can also be excluded in XSLT. Now it is time to retrieve and begin formatting the menu data for use by Microsoft's menu. The challenge is to establish parent child relationships and then create a hierarchical representation of the data. A DataSet object is perfect for this because it can store the structure of an entire database, including relationships, and then convert that relational data into nested XML. Add the following C# code to your Page_Load method. This code uses a DataAdapter to retrieve data from the single database table and to fill a DataSet. Once filled, a DataRelation is applied to the DataSet to establish MenuID and ParentID dependencies. Finally, a call to GetXML() retrieves a hierarchical XML representation of all relational data within the dataset. Dim connStr As String = "Data Source=Talha-PC\SQLExpress;Initial Catalog=MenuDB;User Id=talha;Password=YourPassword;Trusted_Connection=True;"
Dim sql As String = "Select MenuID, Text,Description, ParentID from Menu"
Note: You will have to supply your relevant SQL Server name, Username and Password in the above database connection string, connStr. The XML returned from ds.GetXml() now needs to be reformatted for Microsoft's Menu. XmlDataSource is perfect for this task because it can use XSLT to transform the above XML to another XML format and then provide that to Microsoft's menu. The below XSLT code does just this. It first finds the root node called Menus and applies the MenuListing template to its root children. Next, each Menu node's elements are converted to MenuItem attributes. Finally, each Menu node is checked for the existence of children. If children exist, then the MenuListing will be recursively called until all children are processed. Add an XSLT file to your project named TransformXSLT.xslt with the following code. Note: You can interactively debug an XSLT and an XML file from the IDE's XML Menu. The XmlDataSource object's transformed XML that is provided to Microsoft's Menu is shown below. Run your web page to display the following menu. 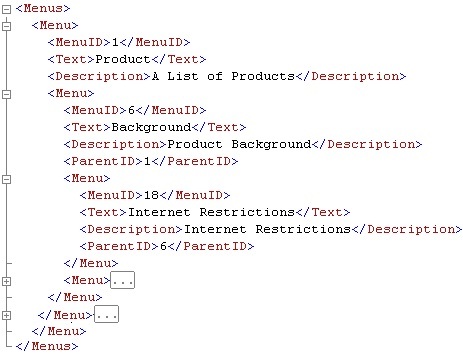 Use the below references to learn how to create table relationships, format menu styles and convert XML using XSLT. I hope its easy to understand. However, for any query, feel free to ask!
. Travel theme. Theme images by rajareddychadive. Powered by Blogger.